Kobe is betting he has the Midas touch. Kobe Bryant’s work ethic is legendary: he’s known for showing up three hours early to practice, sinking 400 shots in drills, and taking midnight bike rides to cross train. And for better or for worse, he’s never been afraid to take a shot. Now he’ll be looking for similar qualities in entrepreneurs he’s backing as part of his new $100 million venture capital fund, Bryant Stibel. The recently retired NBA star co-founded the firm with Jeff Stibel, a former brain researcher and technology company founder, to invest in technology, media, and data companies. Existing investments include video-game designer Scopely and legal-services company LegalZoom, but the pair’s interest already includes sports investments in companies such as sports media site The Players’ Tribune and Kobe’s personal investment in sports drink company BodyArmor (which later secured a merchandise partnership with the Los Angeles Lakers). Stibel says he’ll contribute operational experience building businesses, while Bryant focuses on marketing, branding (he designed the firm’s logo), and identifying winning startup founders, the Wall Street Journal reported Monday (Aug 22; paywall). While Bryant certainly knows the ins-and-outs of the sports world and it would seem like a natural place for him to park some money, there are plenty of reasons why his fund won’t—or shouldn’t—concentrate its investments there. The sports sector has been viewed negatively among many traditional Silicon Valley venture firms, who see selling to professional sports teams or venues as a limited market producing few startups with billion-dollar valuations. Still, Deepen Parikh, a partner at Courtside VC, an investor in sports-related companies, says there is a growing recognition that sports technology and, especially, media are massive markets if companies can expand to related industries. “Sports is a subset of media, at the end of the day,” says Parikh. “That’s a tremendous opportunity for folks like Bryant Stibel or for us … where our main focus is going after companies with exposure to sports” but not limited to the sector. SportRadar, live-streaming service Beam (recently acquired by Microsoft), fantasy sports leagues and even new technology-driven sports like drone racing are gaining attention from investors who had once written off the sector. New investment partners Jeff Stibel and Kobe Bryant give an interview together on CNBC at the New York Stock Exchange on August 22. 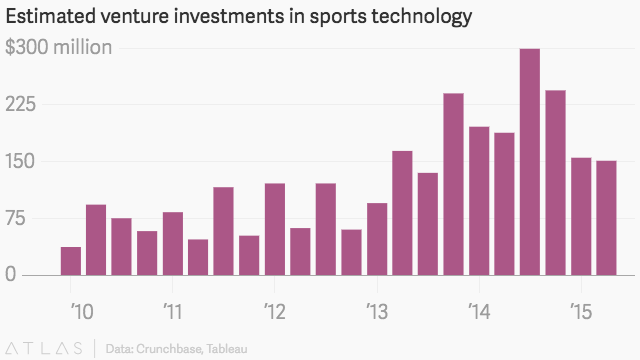 Venture capitalists sunk almost $1 billion dollars into sports technology companies in 2014, CrunchBase reported last year, rising to $2.8 billion during 2015, according to more recent data (sports, in this case, is broadly defined to includes sports-related media, health and technology services). Although the definition of a “sports company” continues to blur, the study found the top 10 venture investments in 2015 were primarily in content and online services, reports Crunchbase. The sector has a number of forces working against it. Sports teams and owners are notoriously risk averse, says Hughes, as most executives demand cost savings and risk reductions rather than splashing out on new technologies. There’s also a finite universe of teams and stadiums to buy startups’ products and services. Many of them are unprofitable, says Hughes. Professional sports teams tend to operate at a loss, relying on leagues’ revenue sharing agreements to shore up their budgets (the Green Bay Packers eked out $29.2 million in net income last year). That hasn’t stopped people from making bets. Sports team owners are getting into the game by funding early-stage companies, including Elysian Park Ventures (affiliated with the Los Angeles Dodgers), RSE Ventures (affiliated with the Miami Dolphins), and Sterling.vc (affiliated with the New York Mets). Of course, Bryant is not alone as a former pro athlete. He’s joining NBA players Carmelo Anthony and Steve Nash, and NFL star Joe Montana, who started their own venture funds.